Shortly after dawn on February 15, 2013, a 18-meter-wide (59 foot) meteor screamed into Earth's atmosphere at 18.6 kilometers per second (41,600 miles per hour). Burning from friction with the air, the 11,000-metric-ton space rock exploded 23.3 kilometers (14.5 miles) above Chelyabinsk, Russia. The explosion released 30 times more energy than the atomic bomb that destroyed Hiroshima. 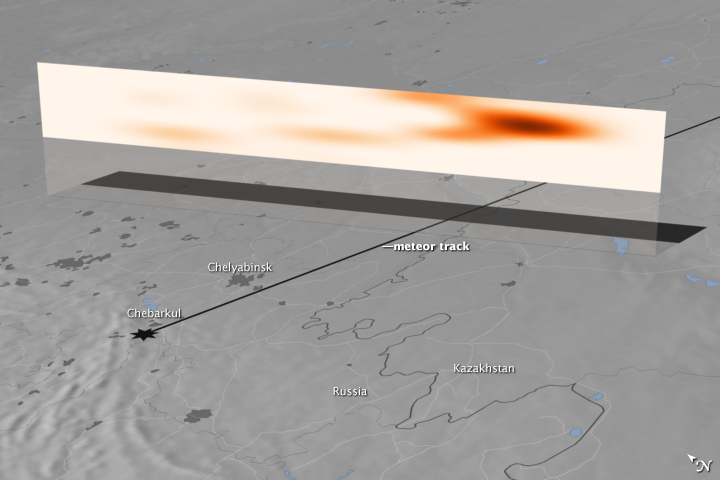 Some of the surviving pieces of the Chelyabinsk meteor (or bolide) fell to the ground near Chebarkul, Russia. But the explosion also injected hundreds of tons of dust into the stratosphere, allowing a NASA-NOAA satellite to make unprecedented measurements of a thin but cohesive and persistent dust belt. About 3.5 hours after the meteor explosion, the Suomi National Polar-orbiting Partnership (Suomi NPP) satellite flew over the area and detected a plume high in the atmosphere, as shown in the image above. The limb profiler instrument in the Ozone Mapping Profiling Suite (OMPS) sensed a mass of aerosols at an altitude of 40 kilometers (25 miles) and moving east at more than 300 kilometers (190 miles) per hour. The cross-section above shows the level of aerosol extinction, or how much the dust and debris blocked sunlight. On February 16, 2013, OMPS detected the plume continuing its eastward flow and reaching the Aleutian Islands. Larger, heavier particles began to lose altitude and speed, while their smaller, lighter counterparts stayed aloft and retained speed—consistent with wind speed variations at the different altitudes. By February 19, the faster, higher portion of the plume had snaked its way entirely around the northern hemisphere and back to Chelyabinsk. Building on these initial, direct measurements, Gorkavyi and colleagues combined their data with a series of atmospheric models to simulate how the plume from the explosion would evolve as the stratospheric jet stream carried it around the Northern Hemisphere. The model simulations agreed with the observed evolution of the plume. And indeed the plume’s evolution continued: at least three months later, a detectable belt of meteor dust was still swirling around the planet, according to OMPS measurements. To view an animation of the meteor-dust model, visit the NASA homepage. 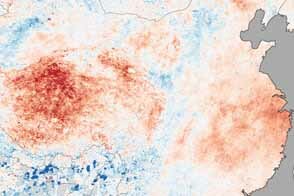 NASA Earth Observatory image by Jesse Allen, using OMPS data from the Suomi National Polar-orbiting Partnership. Suomi NPP is the result of a partnership between NASA, the National Oceanic and Atmospheric Administration, and the Department of Defense. Caption based on a story by Kathryn Hansen, NASA Earth Science News Team. 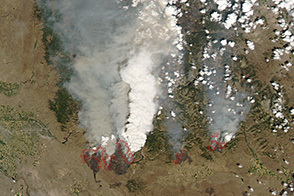 Satellite instruments and computer models help NASA scientists dissect the atmospheric impact of the February 2013 bolide explosion over Russia.